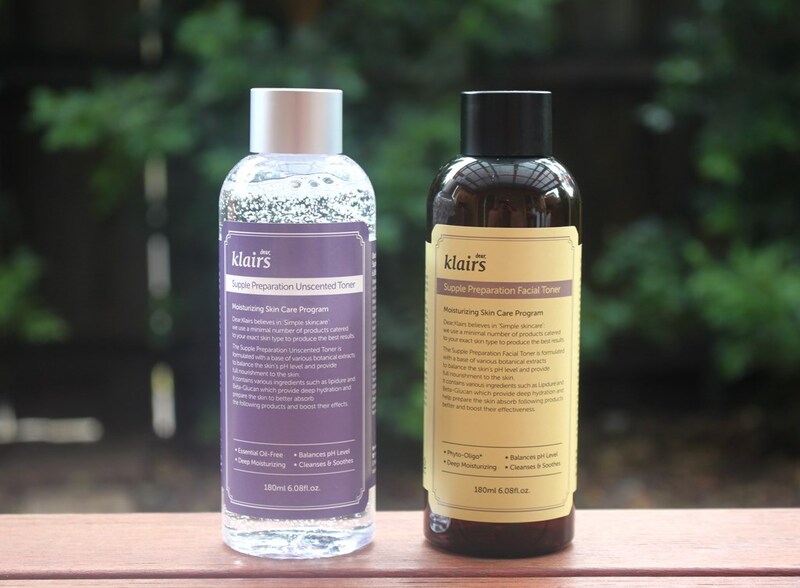 Both varieties of the Klairs Supple Preparation Toner are said to be lightweight and designed to restore skin moisture and pH level after cleansing. 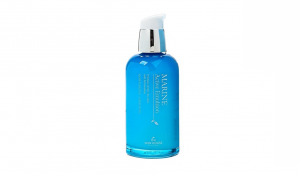 With the aid of plant extracts, hyaluronic acid and beta-glucan, they keep skin calm, hydrated and soothed. Recommended for normal, dry, combination and sensitive skin types. Following water, Butylene Glycol is found in the formulation at the highest concentration. Its ability to improve the penetration and hence increase the effectiveness of the ingredients that follow is its main strength. It also has humectant properties, drawing moisture from the atmosphere for a hydration boost. Also referred to as Methylsulfonylmethane (MSM), Dimethyl Sulfone is able to enhance collagen bundles and restore the skin making it an excellent anti-ageing inclusion. Natto Gum is derived from fermented soybeans and has naturally occurring enzymes, vitamins and amino acids which help diminish the appearance of fine lines and wrinkles, even skin tone through mild exfoliation and enhance the skin’s natural moisturising capabilities. Sodium Hyaluronate is the salt form of Hyaluronic Acid included for hydration. This is achieved through its ability to bind to water and fill the spaces between connective skin fibres, permitting it to retain water for a plumping effect. Its small molecules allow it to penetrate the skin easily and hold up to 1,000 times its weight in water. Traditionally used in Asian medicine for its healing properties, Centella Asiatica Extract is a diverse ingredient offering many benefits. Anti-inflammatory effects ease irritation and acne while restorative properties stimulate new cell growth, build collagen and improve circulation also making it a powerful anti-ageing ingredient. Licorice Root Extract contains glabridin an active compound with strong antioxidant and skin soothing properties which helps sensitive skin to reduce redness as well inhibiting melanin production for brightening. It can assist to diminish the appearance of under eye circles, discolouration and age spots. It also is effective at controlling facial oils making it ideal for oily and acne prone skin types. These results are observed due to the presence of Licochalocne, an oil regulator in the skin. Another ingredient with eastern medicinal origins is the Luffa Cylindrica Extract. When used in skincare, it is employed for its gentle exfoliation, able to remove dead skin cells and stimulate circulation. It has antioxidant, anti-inflammatory, antibacterial and moisturising properties making it a great all-rounder. Beta-Glucan is one of the heroes of the toner, a naturally occurring polysaccharide sugar derived from yeast or oats. It promotes natural self-protecting and repairing capabilities in the skin. Due to its high molecular weight it has good water-binding capacity and so additionally contributes moisturizing effects. In-vitro tests have shown it to be able to stimulate collagen production and reduce the appearance of fine lines and wrinkles. Aloe Vera Leaf and Purslane Extracts are renowned for their ability to soothe, moisturise and soften skin, delivered through powerful anti-inflammatory and antioxidant properties. Other antioxidants in the formulation that protect skin from premature ageing include Tocopheryl Acetate, Sodium Ascorbyl Phosphate and Arginine. Included for their moisturising and skin replenishing properties are Caprylic/Capric Triglyceride and Panthenol while a few amino acids (Arginine, Theanine, Lysine HCL) are thrown in to nourish the skin and strengthen connective tissue for improved smoothness elasticity. Finally, Copper Tripeptide-1 has antioxidant and anti-inflammatory effects to promote wound healing and collagen stimulation. 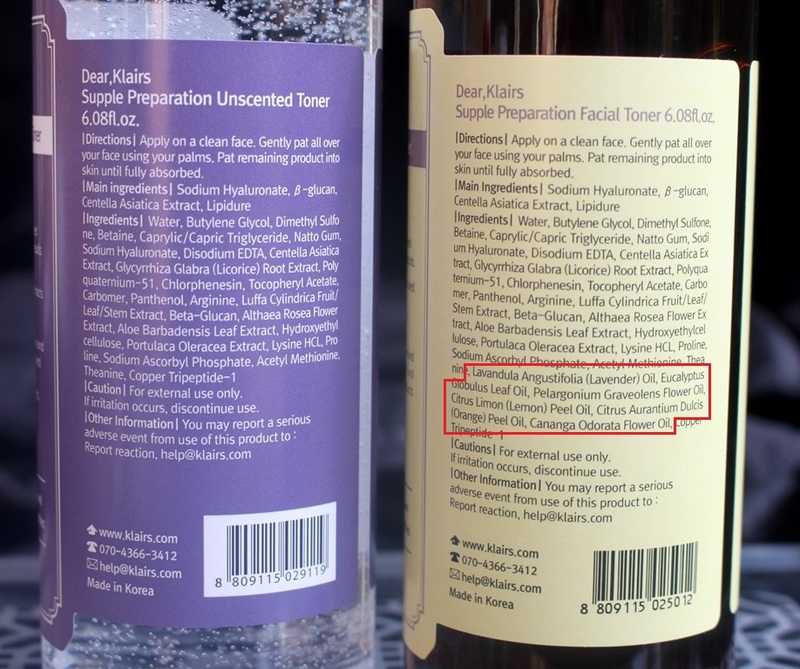 Being the last ingredient in both formulations suggests it is not present at sufficient concentration to have much impact. The scented (original) variety also includes oils derived from Lavender, Eucalyptus, Geranium, Lemon, Orange and Ylang Ylang for the purpose of adding fragrance to the formulation. As they don’t impact the efficacy of the product, it can be concluded that both products should deliver the same performance, at least in theory. Determining which to select will depend on personal preference and sensitivities to essential oils and fragrance. Both toners have an identical composition with the scented version also including some essential oils for fragrance. These are highlighted in the image below and shown in dark red in the list. 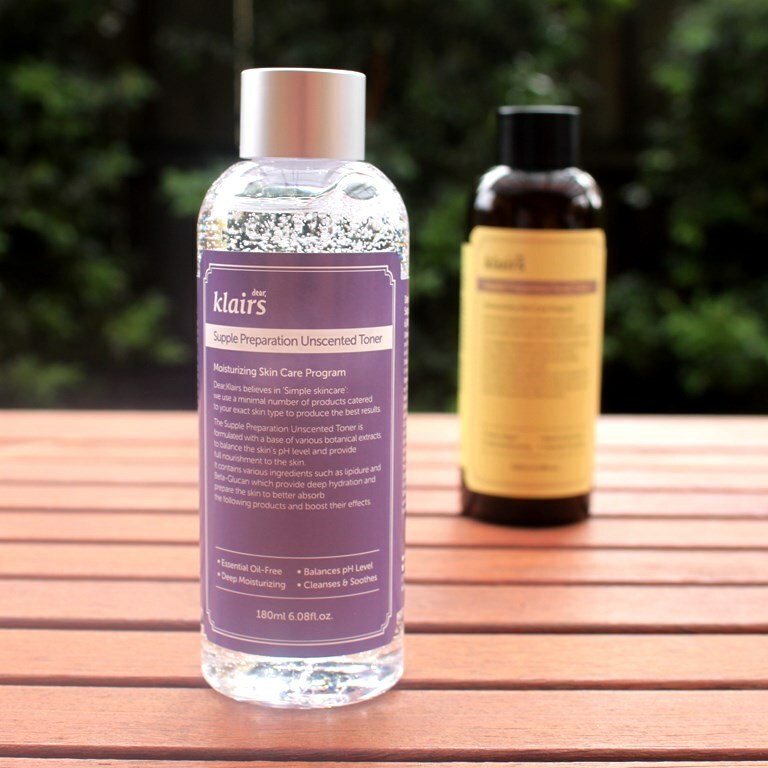 The Klairs Supple Preparation Toners both come in plastic bottles with controlled dispenser top and lid. With regard to safety of the formula, the results vary due to the composition difference although both are rated favourably. 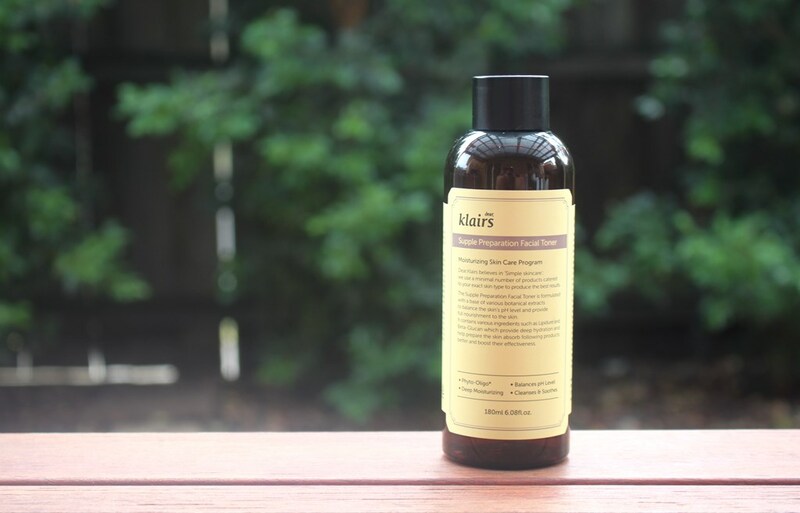 The original Klairs Supple Preparation Toner delivers a CosDNA report which includes an additional mild concern against the added fragrance oils. The new unscented variety, produces an improved CosDNA report. A combined analysis highlighting the difference is shown below. The oils in the red rectangle only appear in the original formula. 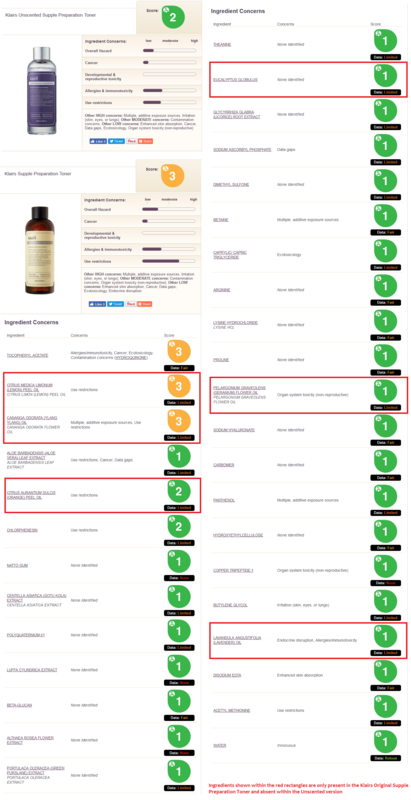 The EWG Reports are similar, the added fragrance raising the hazard rating from 2 in the unscented version to 3 in the original formula due to an increased risk of sensitivity. After cleansing face and neck, pour a small amount of toner onto hands and pat gently onto skin. Alternatively, apply with a cotton pad and swipe gently. Follow with remaining skincare routine. Although entitled unscented, the new version does retain a scent, however this is a result of the ingredients in the formulation and not due to added fragrance. The original formula has a floral scent contributed by the additional oils as discussed above. 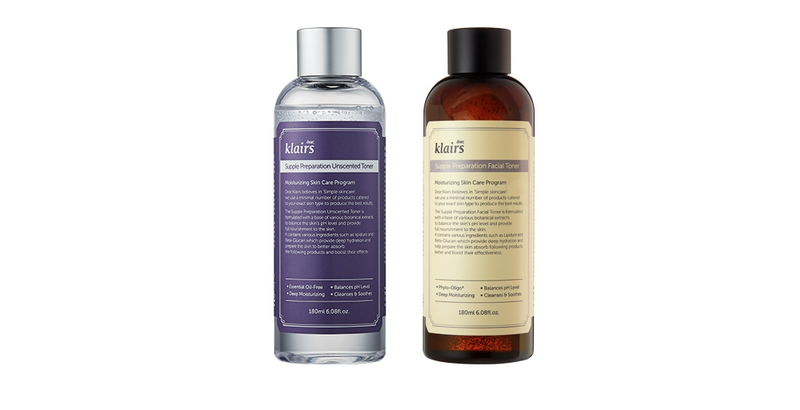 The Klairs Supple Preparation Toners are both priced at US$21.99 each for 180ml of product. 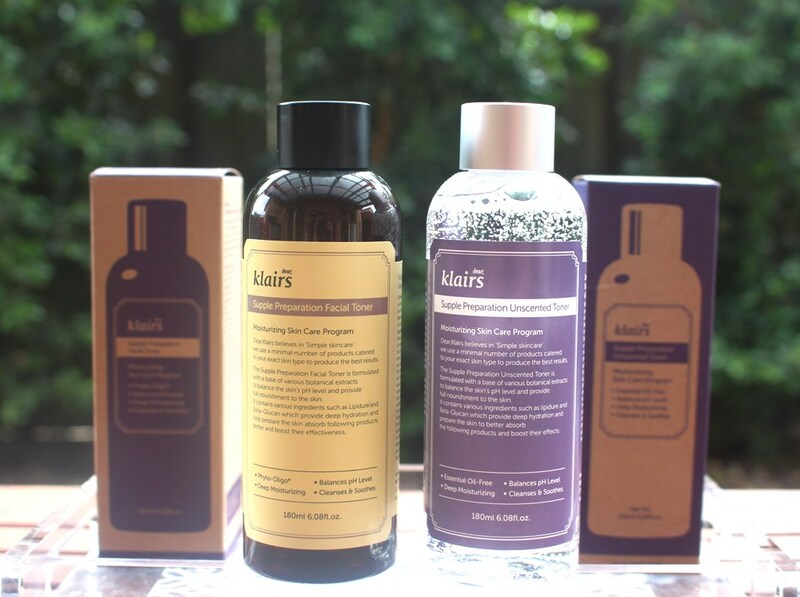 The Klairs Supple Preparation Toners are available from Korean skincare boutiques and online stores like iHerb. I received mine from Wishtrend. 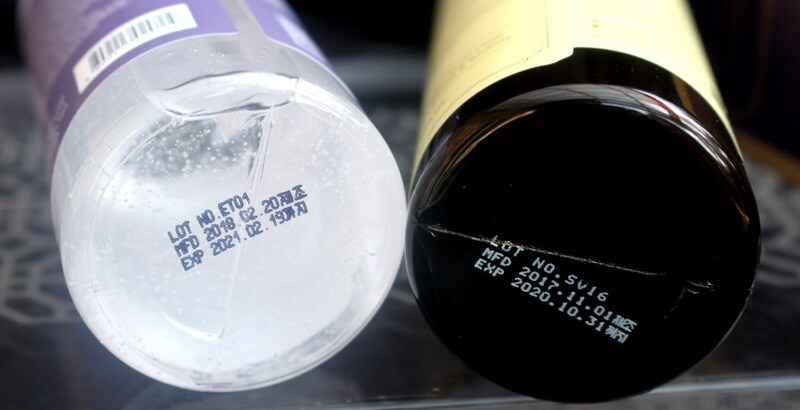 The Klairs Supple Preparation Toners have a 3 year lifespan and must be used within 12 months of opening. I have used the original toner before and have to say that the unscented variety performed in an identical fashion in terms of texture, application and results. This is not unexpected given the formulation is near identical, the fragrant oils simply removed from the unscented version. As such, it made logical sense to write a combined review of both products. The original has a floral perfume provided by the oils which is not unpleasant but clearly the cause of sensitivity for some and the motivation behind the new version. The unscented has no added fragrance but it does have a natural scent which is light and somewhat medicinal in nature. Both dissipate quite quickly once absorbed into the skin. 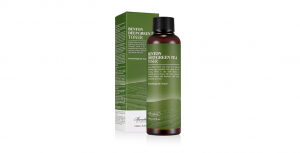 The toner resembles a viscous water, clear in colour and thick in texture. You only need around 3-4 drops to sufficiently coat the face and neck when applying it directly. A few more may be required for cotton pad application simply because the pad will naturally absorb some of the product. Comparing results against the product claims, this is definitely a lightweight toner that delivers good hydration. Skin feels instantly more supple and more bouncy after each additional layer. I practiced the 7-skin method (7 continuous layers of toner) using each version and experienced the same immediate and long lasting hydration. However, given I now have a choice, I would have to say that I prefer the unscented version for this process simply to avoid the unnecessary layering of fragrance oils too. As for restoring pH level after cleansing, I use a pH balanced cleanser so I don’t rely on a toner for this function, however it is important that toning deliver an uncompromised acid mantle. So whether a toner corrects the skin’s pH or confirms it, it is essential in order to prepare for better absorption of the actives that follow. Given this is achieved, this product also fulfils on the pH balance claim. The final claim is that with the inclusion of plant extracts, hyaluronic acid and beta-glucan, the skin is calmed, hydrated and soothed. Certainly the science would support these claims since these are ingredient benefits. Combined in this formulation, my observations also confirm that they deliver these outcomes. 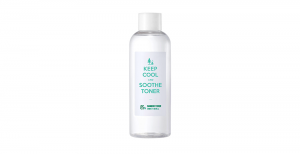 This toner is sufficiently versatile such that you can increase the amount used for improved suppleness and softness, alternatively just apply additional layers where needed to treat stubborn dry patches. Focused application really works to even hydration and provide an all-over replenished feel and supple look. It’s one of the most talked about, Instagrammed and featured toners in Korean skincare for good reason. 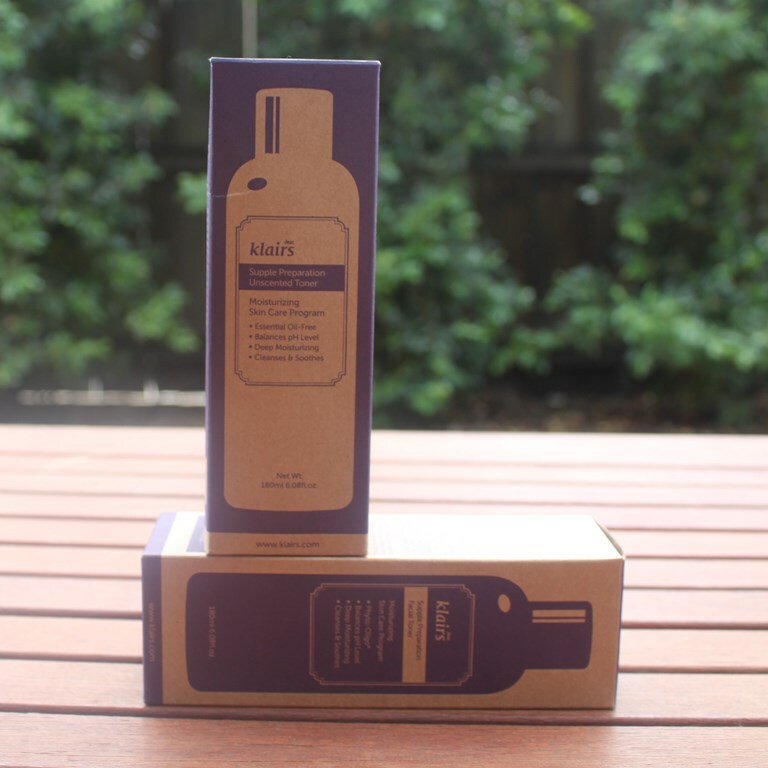 Like so many, I love the Klairs Supple Preparation Toner, scented or unscented. I have never reacted to the original version in the past so have no problem using this one in the future. However, the new unscented version feels lighter without the perfume and is particularly more gentle when performing multiple skin methods. I am an advocate for fragrance free cosmetics so I am thrilled that this classic has been given a fresh new image. I have two bottles of the original which I will finish and enjoy but moving forward, I will opt for the unscented variety. Regardless, I will never say no to either! With the release of the unscented version, all skin types, sensitive or otherwise, can enjoy the benefits of this superb product. The unscented product was provided to me free of charge by Wishtrend for review. This post only includes my honest opinion and experience of this product and is in no way influenced by Wishtrend, Klairs, their representatives or any other third party.